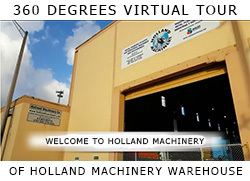 Many of the machinery listed are in stock, however, since our inventory is constantly changing, we ask that you contact us at 305/635-2325 or email us at sales@hollandmachinery.net to confirm availability of a particular machine. Also, please call or email us if there is a particular equipment that you are looking for that is not listed on our website. We look forward to being of service.